What a finish: Shanshan Feng, 22, shot the best round of the week Sunday, a 5-under-par 72. PITTSFORD, N.Y. -- Golf instructor Gary Gilchrist once said that having a major winner would make the sport really take off in China. Now let's see if that happens. Mainland China got its first-ever LPGA tour winner Sunday, and that victory came in the women's second major of the year. 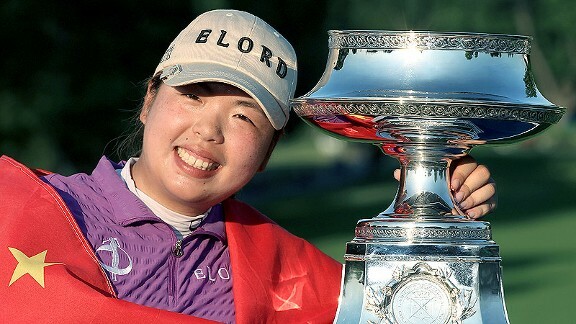 Shanshan Feng played the best round of the week, a 67, at Locust Hill and won the LPGA Championship at 6-under 282. Feng, 22, moved to the United States as a teenager to train for golf. She is coached by Gilchrist, as is world No. 1 Yani Tseng of Taiwan. While this was a tough week for Tseng -- the defending champion finished tied for 59th after a 76 Sunday -- it was a coronation for Feng. She and Tseng have been friends and competitors for a decade as they moved up from the junior ranks to pro golf. "I was always trying to chase her," Feng said of Tseng's greater success to this point. "Right now, I'm still chasing her. But I got a little closer." Did China get closer to becoming a potential world golf power? We can't say for sure that Feng's victory will have the same enormous impact on Chinese golf that Se Ri Pak had on South Korea after winning two majors in 1998. But considering the world's most-populated country is building new courses and more Chinese continue to take up the sport, it seems nearly certain that China will become a bigger factor on the LPGA tour. "I think I'm just lucky, you know?" Feng said. "There are good players from China now. I became the first one [to win], but I'm sure there will be more people winning in the States and in the majors. I would say if Koreans can, Chinese can." Feng speaks excellent English and has a very clever sense of humor, even in her second language. She told of how her host family at this tournament offered to fix her breakfast Sunday morning, which produced a positive omen. One of the eggs cracked for the meal had two yolks, which some consider a sign of good luck. Does she believe in such superstitions? "When it works, I believe it," Feng said. But it wasn't luck that got Feng to this point. It was good old-fashioned hard work and perseverance. Her father works with the Chinese golf association, and she started playing at age 10. She attended school from 8 a.m. to 5 p.m., and then had only two hours to hit balls. The putting green she practiced on was bumpy and slow. On weekends, she would try to get in some rounds. To really advance in golf, she and her parents knew she had to move to the United States. She came alone and went to Gilchrist's academy in Florida. She praised Gilchrist for his guidance and friendship, and she has become yet another of his success stories. When Pak won the LPGA Championship 14 years ago, it was her first tour victory. The same for Tseng when she won in 2008. Now, Feng is a first-time winner at this major, which dates to 1955. The first Asian woman to win this title was Japan's Chako Higuchi, way back in 1977. But she didn't spur a wave of Japanese players to the LPGA because she actually spent the majority of her career playing professionally in her home country. Two Japanese women -- who have the same last name but are not related -- had a chance to win here Sunday. Mika Miyazato shot a 69 and finished in a group tied for second at 284, along with American Stacy Lewis, Norway's Suzann Pettersen and third-round leader Eun-Hee Ji of South Korea. Ai Miyazato also had a very good Sunday, with a 68, and tied for sixth at 285, along with Australia's Karrie Webb and American Gerina Piller. Webb, a seven-time major winner, is the player Feng said was her idol when she started playing. Webb began the day a shot off the lead, but she ended it with a lot of grass stains on her shoes. That's because she spent so much of the final round in the tall stuff. What's the one thing everyone was worried about this week at Locust Hill? The rough. Webb hit just eight of 14 fairways and spent too much of the day scrambling. Piller, who is married to PGA tour pro Martin Piller, briefly surged into a tie for the lead with birdies on Nos. 14 and 16. But she then committed one of golf's cardinal sins: double-bogeying a par-5. That stumble on No. 17 cost her a chance at her first LPGA victory. Still, she seemed relieved to be done on a tough course with a top-six finish. "This has been the longest four rounds of my life," said Piller, a New Mexico native who played collegiately at UTEP. "I'm just thankful to be where I am now." As opposed to the cloudy weather Saturday, the skies were solid blue and the temperature hot for the final round. These are the kinds of days when major memories are made. A victory by Lewis, who is now the top-ranked American, Piller or Paula Creamer might have captivated a U.S. audience more. But with Feng going as low as she did, none of the Americans could catch her. Creamer shot a 71 and tied for ninth. Lewis had won two of her previous three starts, including last week at the ShopRite LPGA Classic. But she hit just five fairways in a round of 72. Not surprisingly after all the hacking she had to do, Lewis said she looked forward to a massage and being off this week, when the men monopolize golf's stage with the U.S. Open. "My back hurts, my feet hurt, my wrists hurt, my elbows hurt," Lewis said. "Bogeys on 10 and 11 really hurt me. But I made birdies on 12 and 13. I wasn't watching the leaderboards until I got to 17 and saw Shanshan was 6 under. I fought all day and gave it a good run." Feng wasn't looking at the scores being posted, either. She started the day three shots off the lead and was in the fourth-to-last pairing. Keeping the mindset of focusing on only the next shot, she didn't even realize she was leading the tournament until the last hole. Feng had birdies on the second, sixth, eighth, 12th and 17th holes. She finished with a par, then watched as no one on the course was able to close the gap. "Shanshan went out and shot a great round, and that's the way you want it to be," Lewis said. "You don't want this golf tournament to end with someone making bogey on the last hole to win it. She went out and won it today, and congratulations to her. "I was surprised she hasn't won out here before; you knew it was coming at some point." Feng's previous best finish in a major was a tie for 22nd at the Kraft Nabisco Championship on April 1. Three victories in the past year on the Japanese LPGA tour helped boost her confidence, and this win puts Miracle-Gro on it. She wasn't sure how she would celebrate, but said she may try to get to China because she would like to see her parents. "And I'm sure they want to see me, too," Feng said. Probably a whole lot of people back home do.